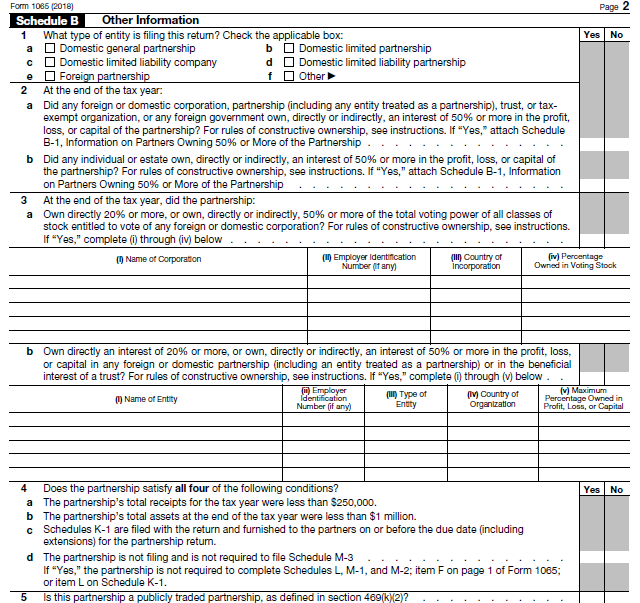 Form 1065 is used by partnerships and multi-member LLCs taxed as partnerships to report business income and expenses. Because a partnership is not a taxable entity, net earnings are reported on each partner’s personal tax return. Form 1065 is necessary to report all partnership income, deductions, and credits for the tax year. We recommend hiring an accountant or using tax software such as TurboTax instead of preparing Form 1065 manually. By using tax software, you can be sure that you will get all of the tax deductions that you qualify for, and the software will electronically file Form 1065 with federal and state agencies. Start your 1065 tax return (free to try, pay when ready to file). Before preparing Form 1065 for a partnership, you will first need to gather the relevant financial data. You will need financial statements for the tax year, information for each of the partners, and in-depth details about fixed assets and tax payments. 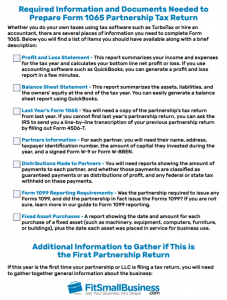 We created a free Form 1065 checklist to help you gather this information. Profit and Loss Statement: Summarizes the partnership’s income and expenses for the tax year and calculates the bottom line net profit/loss. If you use an accounting program like QuickBooks, you can run a Profit and Loss report in just a few minutes. 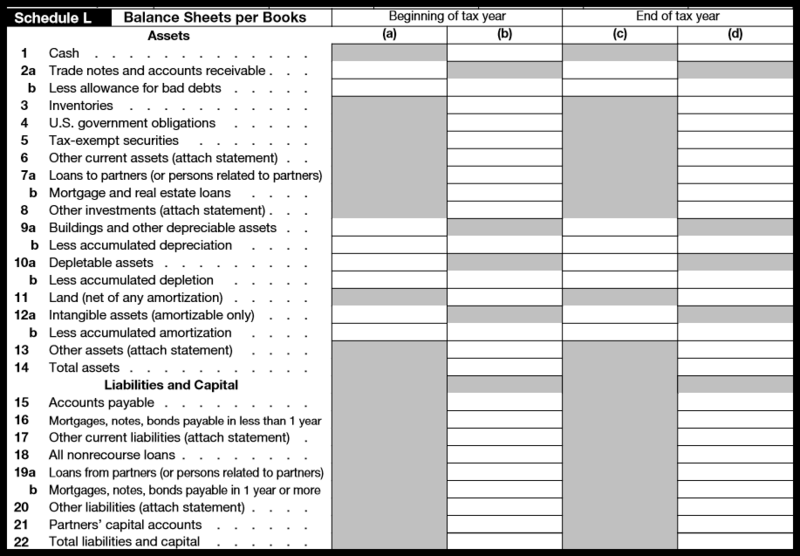 Balance Sheet Statement: Summarizes the assets, liabilities, and owner’s equity as of the end of the tax year. You can easily run a Balance Sheet report if you use QuickBooks. Last Year’s Form 1065: You will need to refer to last year’s partnership return, so have that handy when preparing this year’s return. Employer Identification Number: This is your federal employer identification number, also known as a taxpayer identification number. If you don’t yet have this number, you will need to apply for one from the IRS before filing the partnership return. Start Date of Business: You will need to provide the date you started the business. Principal Business Activity Code: This numeric code represents the principal line of business the partnership is engaged in. Select the code that best describes your partnership from the list provided in the Form 1065 Instructions. Principal Business Activity: This is a short description of the nature of the partnership’s business activity. Examples include manufacturing, retail, food service, or professional services. Principal Product or Service: This is a short description of the primary product or service the partnership offers. Examples include toys, restaurant, or accounting. Accounting Method: Cash or accrual are the most common accounting methods. For more details, check out our guide on the cash versus accrual method. Number of Partners: Total number of partners in the business. Partners Information: For each partner, you will need their name, address, taxpayer identification number, the amount of capital they invested during the year, and a signed Form W-9 or Form W-8BEN. Distributions Made to Partners: You will need reports showing the amount of payments to each partner, and whether those payments are classified as guaranteed payments or as distributions of profit, and any federal or state tax withheld on these payments. Form 1099 Reporting Requirements: You will need to know if the partnership is required to issue any Forms 1099, and whether the partnership actually issued the Forms 1099. For more details, check out our guide on Form 1099 reporting. Fixed Asset Purchases: You will need a report showing the date and amount for each purchase of a fixed asset (such as machinery, equipment, computers, furniture, or buildings). You will also need to know the date each asset was placed in service for business use. With QuickBooks, you can save time and stay organized by automatically generating reports, including the profit and loss accounts and balance sheets. Even more exciting, accountants can import your QuickBooks data to speed up their tax preparation process. Get started today with up to 50% off QuickBooks Online. Now that you have financial statements and information about the partnership and the partners, let’s start preparing the partnership tax return, starting at the top of Form 1065. 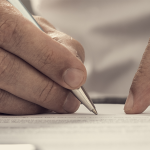 The top portion of Form 1065 asks for general information about the partnership, such as the name, address, and type of business the partnership operates. 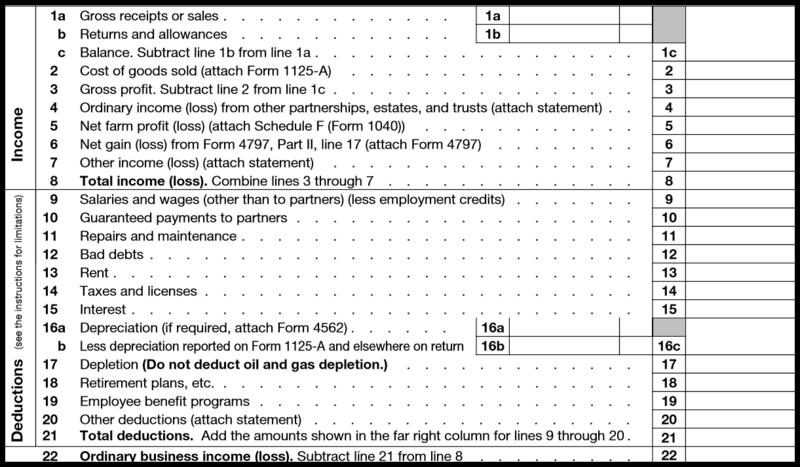 On the first page of Form 1065, we show the business income and deductions of the partnership. The purpose of this section is to calculate the net ordinary business income (or loss) for the tax year. Details about income and expenses will come from the partnership’s profit and loss statement. 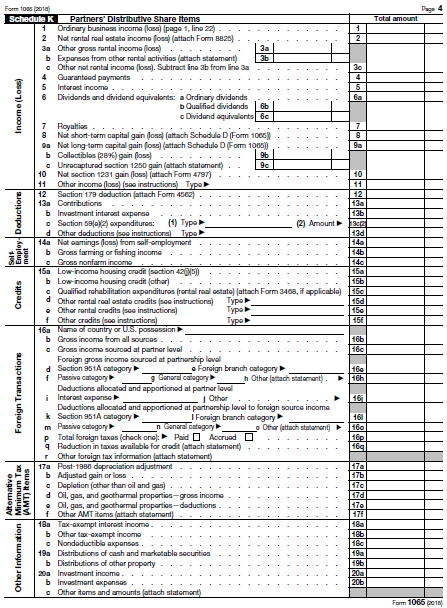 Investment Income: Income from rental activities and from investment portfolios are reported in a different section of Form 1065, on Schedule K.
Profit and Loss Report: If you use accounting software like QuickBooks, we’ve put together a guide to help you prepare a profit and loss statement. You’ll use your profit and loss statement to complete this section of Form 1065. Additional Information: Some line items require a separate schedule, form, or statement to provide additional details. Schedule B, found on the second and third pages of Form 1065, asks 25 questions that require a yes/no response. These questions are technical in nature. You will need to refer to the Form 1065 Instructions for detailed discussion of each question being asked. Some questions focus on individuals or entities (i.e., corporations, partnerships) that own 50% or more in the partnership. Some questions ask about investments the partnership has made into other partnerships or corporations. The answer to question 4 determines whether the partnership needs to fill out the balance sheet items on Schedules L, M-1, and M-2. If the partnership has bank or investment accounts in countries outside the United States, pay particular attention to question 8. If any partners in your partnership are foreign nationals, pay attention to question 14. The partnership may need to withhold tax on income allocated to foreign partners. The purpose of question four is figuring out if you must prepare the Balance Sheet (Schedule L), book to tax reconciliations (Schedule M-1), and analysis of partners’ capital accounts (Schedule M-2). If you can answer “Yes” to all four questions, then you are not required to complete Schedules L, M-1, M-2, or M-3 of Form 1065. Total Receipts: Did the partnership earn less than $250,000 in gross receipts during the year? Total Assets: Was the partnership’s assets less than $1 million during the year? Timely Filing of K-1s: Did the partnership furnish a Schedule K-1 to its partners on or before the due date, including any extensions? Schedule M-3: Is the partnership required to file Schedule M-3, net income reconciliation, for the year? Among other things, Schedule M-3 is required when a partnership has total assets of at least $10 million, has total receipts of at least $35 million, or owns at least 50% in another partnership that is required to file an M-3. Schedule K is a summary of the partnership’s income, deductions, and credits for the year. The amounts shown on Schedule K will be allocated to each partner using Schedule K-1. Each partner will receive a Schedule K-1 so that they can include the income from the partnership on their personal tax returns. The purpose of Schedule L is to provide the IRS with the details of all assets, liabilities, and equity of the partnership as of the beginning and the end of the tax year. If you use an accounting program like QuickBooks Online, this information will come directly from your Balance Sheet report. The purpose of Schedule M-1 is to show any differences in how income and expenses are reported for bookkeeping purposes and for tax purposes. Any differences between the two methods are summarized on Schedule M-1. Not everyone needs to fill this schedule out, however. The purpose of Schedule M-2 is to show changes to the partners’ capital account for the year and to calculate the ending balance. If you are familiar with the accounting equation that assets equal liabilities plus equity, the partners’ capital accounts represents the equity portion of this equation. Schedule M-2 (IRS Form 1065) shows changes in the partners’ capital or equity accounts. The deadline to file Form 1065 is March 15th for calendar year partnerships. A six-month extension moves the deadline to September 15th. Deadlines falling weekends or holidays move to the following business day. For fiscal year partnerships, Form 1065 is due on the 15th day of the third month following the fiscal year-end. We’ve discussed how to prepare partnership tax returns using Form 1065. Below we answer some common questions that come up about preparing partnership tax returns. If you have a question about Form 1065, feel free to post your question in the FitSmallBusiness Forum. We’ll be glad to answer your question. Do a husband & wife have to file partnership returns? Maybe. If you formed a limited liability company or other business entity with the state, then you will need to file Form 1065. However, if you have an unincorporated general partnership and both spouses own and operate the business, then you may elect to file two Schedules C under the rules for qualified joint ventures. Does each partner need to file a Form 1065? No. The partnership or LLC files one Form 1065 for the year. That Form 1065 tallies up income, deductions, and credits for the year. It then allocates that income, deductions, and credits to each partner using Schedule K-1. Each partner uses Schedule K-1 to prepare his or her own personal tax return. Can an LLC have a foreign partner? Yes. LLCs and partnerships can have foreign partners. There are some additional tax responsibilities, though. The LLC or partnership will need to withhold federal and state tax on the income allocated to foreign partners. Foreign partners need a U.S. taxpayer identification number and need to file their own tax returns in the U.S. Which software can handle Form 1065? You will need a tax software program that can prepare business entity returns. TurboTax can prepare partnership tax returns. TurboTax Business can also import data from QuickBooks and can create Form 1099-MISC. After reading this article, you should have a pretty good idea of who is required to complete Form 1065. This includes knowing what information and documentation you should have handy. You can now manually fill out Form 1065. However, you can also use TurboTax to complete your tax return this year. TurboTax will search for all of the deductions that you qualify for and handle all of the necessary calculations to complete Form 1065 for you. Take TurboTax for a free 30-day test drive to see for yourself. 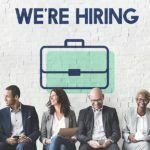 Can an LLC S Corp be single member ownership? Hi Devvie, good question. I know that you can be a single member LLC but I don’t believe you can be a single-member S Corp. I believe an S Corp requires at least 2 or more people. I recommend that you contact a tax professional who can definitely answer this question better than I can. Check out our National Bookkeeper directory to see if there is a local expert in your area. I am working on a final year Form 1065 for a real estate business. Unfortunately I am not familiar enough with this form to give you an answer to your questions. However, what I will say is that these figures should be directly from your balance sheet and income statements. If you are confident that those numbers are accurate and what you are putting on Form 1065 matches those figures you should be ok. However, my advice to you is to find a tax preparer who can review this form for you and make sure it is correct. We’ve got a bookkeeper directory that includes a number of bookkeeping firms that do tax prep work. Here is the link to the directory. I have a question – We have started a LLC in October 2017 to flip houses. The project is still going and I have a Cash basis business – should I need to file a $0 tax return for 2017? A small house was bought in October 2017 and repairs are still going and would sell the same in 2018. Hi Param, congrats on your house flipping business! Unfortunately I am not able to give you tax advice. I recommend that you find a tax professional that can assess your particular situation. Thanks for the easy, helpful information! Would you mind looking over the section “Form 1065 – Schedule B – Question 6 A thru D”. It should read if you can answer “Yes” to the questions then you don’t need to fill out the schedules. “No” would mean you make more than $250k and etc. Just thought that might clear up some possible confusion. Linda, thanks so much for the feedback! It’s amazing how one word can make all the difference. I appreciate you taking the time out to inform me of this error.